That’s right. 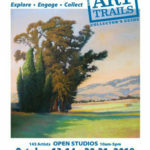 As part of ARTrails, the Farnsworth studio will be open Saturday and Sunday, from 10:00 AM – 4:00 PM. Come on by and see what’s new and meet with John Farnsworth. And if you can’t make it, don’t worry. The studio is open again next weekend, the 20th and 21st.